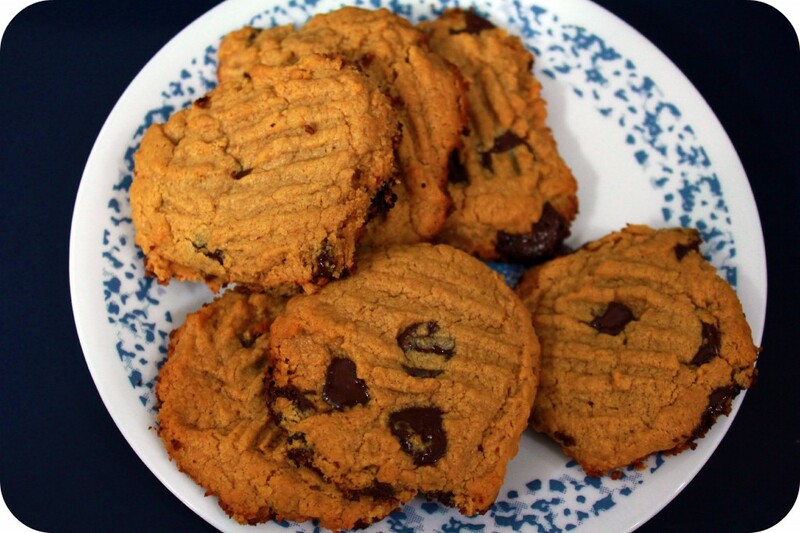 Organic Dark Chocolate Peanut Butter Cookies. It’s hard to find someone who doesn’t looooove peanut butter and chocolate. They are practically made for one another and I’m not one to come between a perfect relationship. Well, cookies aren’t necessarily part of a healthy diet but, I choose to live by the 80/20 rule, eat well 80% of the time and treat yourself 20%. So, if I have a bit of a sweet tooth I love to whip up my Decadent Dark Chocolate PB Cookies! I can enjoy a treat and not feel guilty about it! 1 cup of your favorite organic peanut butter. 1/4 cup of organic bittersweet dark chocolate chips. Will make about 24 cookies. Pre-heat your oven to 325°F. I prefer to use my small toaster oven to use less energy, opposed to heating up the whole oven for a small batch of cookies. But, it’s up to you! Place 1 cup of peanut butter in a mixing bowl, add sugar and eggs and mix well. Once the mixture becomes more batter-like, add the desired amount of dark chocolate chips. 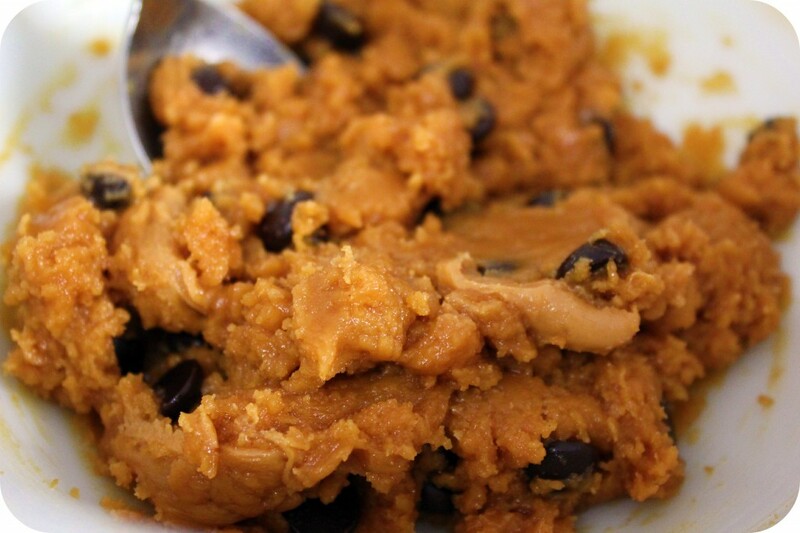 Once the batter is prepared, take a tablespoon and begin to scoop into a nice little heap. So that they are almost in the shape of little balls. Place little scoops evenly on non-stick baking pan. Then with a fork, apply a little pressure to the scooped batter and for that traditional peanut butter cookie that we all know, make sure to leave those little lines so they can bake in. Place cookies in the oven and bake for about 15-20 minutes or until golden brown. Make sure you don’t overcook and if you aren’t sure if they are done, just shut the heat off and leave them in for a little longer. Make sure you let the cookies completely cool before attempting to serve. 1/2 cup of your choice of sugar. I use organic brown sugar for the girls. Pre-heat your oven to 325°F. I prefer to use my small toaster oven to use less energy, opposed to heating up the whole oven for a small batch of cookies. But, it's up to you! Place 1 cup of peanut butter into a mixing bowl, add sugar and eggs and mix well. 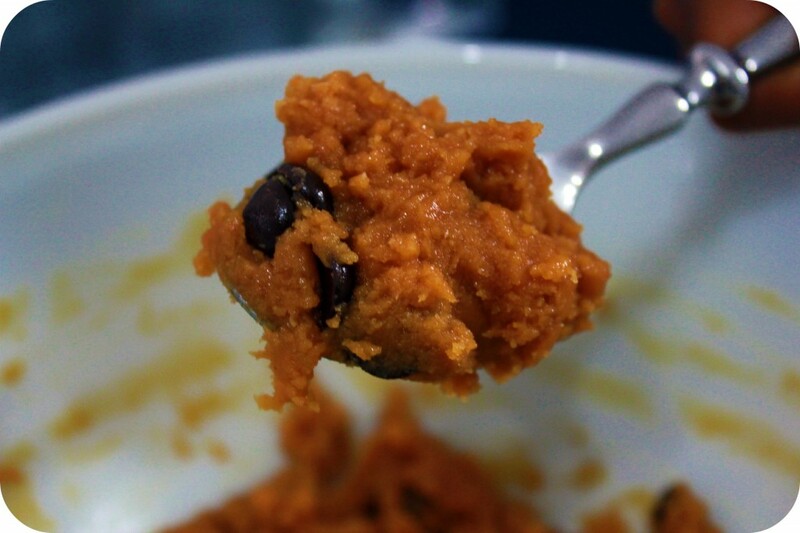 Once batter is prepared, take a tablespoon and begin to scoop into a nice little heap. So that they are almost in the shape of little balls. 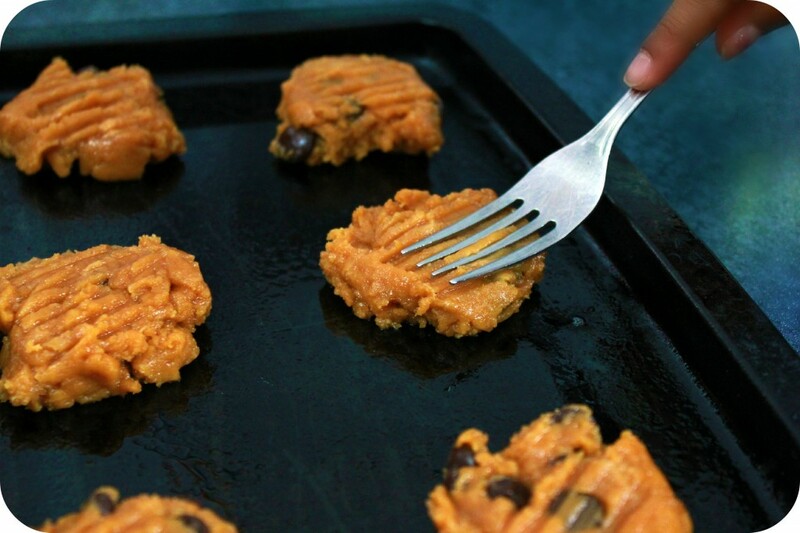 Place cookies into oven and bake for about 15-20 minutes or until golden brown. Make sure you don't over cook and if you aren't sure if they are done, just shut the heat off and leave them in for a little longer. Once cooled. Grab a cup of milk and serve! I love having this treat once in a while. The best part of this recipe is that is very simple and the kids can help, Gabby helped me with these! You can choose to make this organic too by substituting ingredients of the organic kind. Or whatever you have in your pantry. I always try to have most organic stuff on hand anyway but, that’s just MOI. I love that the peanut butter can be used as a good fat and that the dark chocolate gives you a little bit of anti-oxidants. Not to mention, they are delish! They certainly look delicious !